I was recently trying to use VMWARE Player to run some 64 bit virtual machines which a colleague had built for me. I used Google to find out if it would be possible to run the 64 bit guest OS on a 32 bit host - unfortunately the results seemed to be split almost 50-50 between saying yes and no, so I had to try it for myself. When I tried to power on the virtual machine I got the following error screen. I went to the link suggested by the error page and I downloaded the utility to see if my CPU was capable of running in 64 bit mode. The tool from VMWARE told me that my CPU was not capable of running a 64 bit operating system. 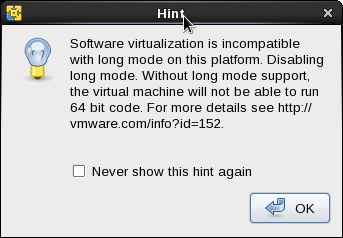 This puzzled me because until recently I was running a 64 bit operating system (RHEL6) on the same laptop. I still thought that the problem might be that it is not possible to run a 64 bit guest operating system on a 32 bit host operating system. Then I remembered that I still had kept the boot partition for the 64 bit OS, so I booted this partition and tried again to run the virtual machines. Puzzlingly I still got the same result. The VMWARE test utility was also still telling me that my CPU was not capable of operating in 64 bit mode which was deifnietly not true since it was running in 64 bit mode when I ran the test. I did a bit more digging and I found a utility from KVM which is supposed to check if your system can run 64bit virtual machines. It also told me that I couldn't, but it gave a very different error message. As the error message suggested, I went into my BIOS settings and enabled support for "Intel Virtualized Technology" and hey-presto I was able to run the 64 bit virtual machines. Unfortunately I don't really know what "Intel Virtualized Technology" is, but this article seems to have a feasible explanation. Am I really a human?